I confess – I’ve been a slacker lately when it comes to paper mache sculpture, and I’m starting to feel guilty about letting my blog go for so long without a new post. I have good excuses, of course. I’ve been building a chicken house, reading up on gardening, and entertaining guests. But, excuses aside, I sometimes need to throw myself into something different in order to recharge the creative batteries. These mirrors are bright, creative, and fun. That’s it for today’s post. The sun is shining, and I still haven’t finished that chicken house…. Hi Jonni, I love your site. I came here looking for a paste recipe for a homeschool project but I have been hankering to make some paper mache puppets and couldn’t find a tutorial (about a month ago since I looked). Well I must not have looked in the right places because here I am now! Can’t wait to try this. I am generally into crochet, knitting, and sewing but hey…what’s one more craft?! Hi Leslie. Did you see Dunja’s guest post about making paper mache finger puppets? Hi Jonni, thanks for mentioning my In the Garden Series: Paper Mache Tea Set! Since my boys were able to make their own dishware and get messy the day before, they were willing to participate in the tea party long enough to chow down some cookies and satisfy my niece. I would say it was successful, considering it was a two year old, a seven year old and an eight year old that participated in the event (all who don’t really have very long attention spans anyway). And since they were all willing to do it again later in the day for a chance to have more cookies, it really worked out well! A weed barrier!! That’s a great idea. I think. Hm. I’ve used cardboard and newspaper, with acceptable success. Wonder what advantage the paper mache would give? Denser? I just found the latest salmonella scare in dog food news – so even what goes in our pets isn’t necessarily safe, let alone what comes out. Humanure has been tested under ideal circumstances (hot compost and/or worm bins) and some folks say it’s safe for the garden. I have no idea how to test that theory – is there a lab one can send one’s compost to, to see what’s living in it? With the energy expenditure required to make chemical fertilizers, I can see a day when we might need to go back to reclaiming all the nutrients we take from the land. But, at the moment, I think I’ll stick with worm poo. I’ve got lots. And I don’t actually know why that fellow in England uses paper mache for weed barriers. It sounds like a lot of work, to me. But the worms would love it. They really like white flour. I just looked up (again – I do this occasionally) pet waste composting, and it looks like some people are using worms to do the dirty work. I’ve been able to just dig a very deep hole, fill it over time nearly full with waste, top it with the removed dirt, and dig another nearby. I’ve been told that it takes about 2 years to turn it into good ol’ soil. I haven’t been brave enough to dig in the same spot as an old hole yet! This doesn’t, however, keep “baddies” out of the watershed, which is an issue. That’s an interesting idea, about corn being the culprit. *looking skeptical* I’ll have to look into that! As for feeding dogs a vegan diet, it appears to be not only do-able, but a pretty good idea (rising cancer in pets, all the recall trouble, unimaginable stuff hiding in that can or bag … ). As long as they’ve got humans to cook and mash up their food for them, it doesn’t matter where the nutrients come from. Cuts out a lot of environmental destruction as well as (of course) a lot of unnecessary slaughter of other animals. Anyway, I’m still researching that, but it looks like it won’t be any harder than when I changed my own diet to vegan. In case you’re interested, you can now see my “three” baby backyard chickens” on my new blog. And find out why I put “three” in quotes. 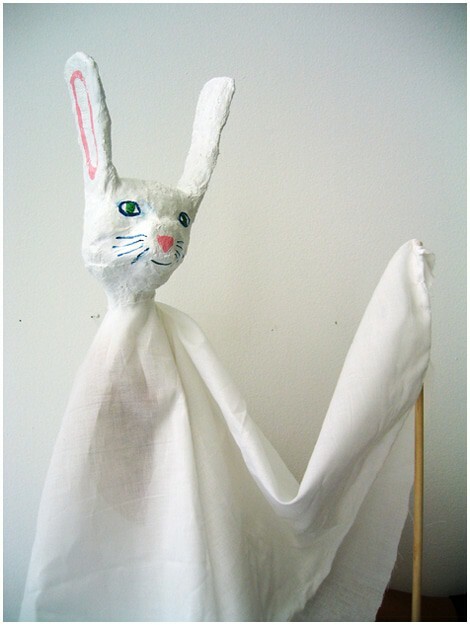 I love the rabbit puppet idea. Next time grandkids are here we’ll have to try that. What do you think about modifying it to use your clay recipe? For slightly older kids, you could get into more detail maybe. Or for adults, for that matter! I’ve been having a sort of vacation from my artwork as well (or, you could call it procrastinating, if you must!) Thanks for posting something creatively inspiring again. Hi Xan. Since I can easily walk downtown, I’m not sure I can call myself “suburban…” But the town’s too small for the urban label either. So – big question – if I put my garden on a new blog, what would I call it? The clay recipe would work great for the rabbit, as long as the youngest helper was old enough to not eat the stuff, since it isn’t edible. I’d also suggest leaving the linseed oil out of the clay recipe if very young kids are using it. The clay still works fine without it. And yes, you could get a lot more sculptural detail with the clay, although the painted eyes are nice, too. Hm! Another blog… Maybe we need to know more about your feelings or approach to your new gardening exploit to propose names for it? I, for one, would be an avid reader! I know what you mean about having your head spin after devouring a lot of research (I’m researching veganizing my dogs at the moment), and how welcome a clear picture would be! I’m guessing you’ll be improvising on the theme just about immediately, being you. I think my 11 year old grandson, while being a hearty eater, can keep paper clay out of his mouth. The younger ones are too little for crafts at all yet. Finnegan enjoyed another paper mache project we tried last year. He sculpted a … well, he called it a volcano, but it looked like a lumpy donut to me. And an eyeball, though that could have passed for a golfball, since he never got around to painting it. Still, both are on what appears to be permanent exhibit in the living room of his home, so I have high hopes for another project. I can’t wait for my own grandson to get old enough to do art projects with. It sounds like you have a fun visit ahead of you. Improvising? Me? Ok, I confess – I will be changing things a little, mixing and matching here and there. I might call my garden “The Just in Case Place” — just in case we really are going to have a 10-year long recession like some economists are predicting. Lots of fruit trees, veggies, etc. Hopefully enough to share some with neighbors. Still not sure how my large carnivorous pets fit into the picture. Not so much because I can’t raise their food, or that their poop can’t go into the garden, but because my garden will cover their play space. I guess they’ll just have to put up with it. At least with the chickens I’ll have a few omnivorous pets to balance out the herd.